Good golly I met Miss Molli! 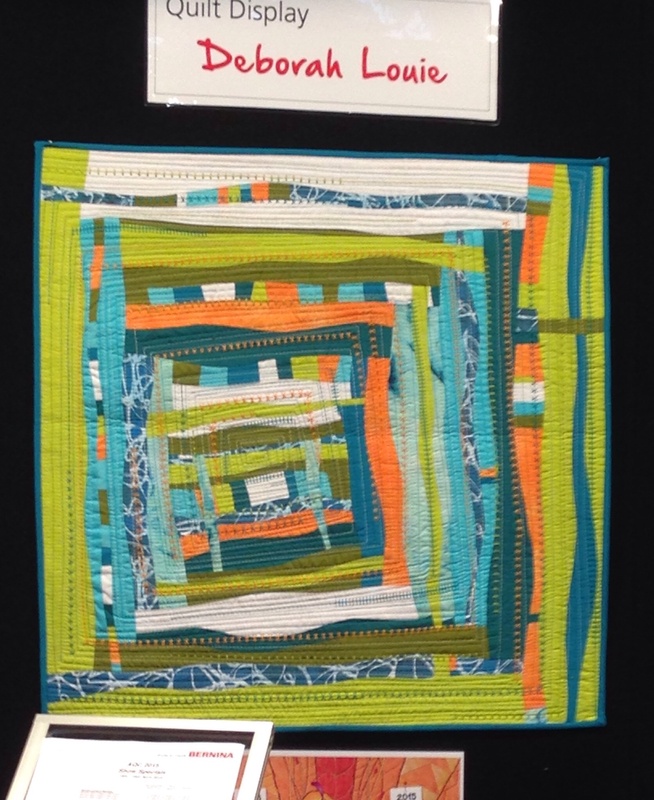 Our first piece in the quilt sandwich of AQC was Helen Stubbings from Hugs ‘n Kisses. 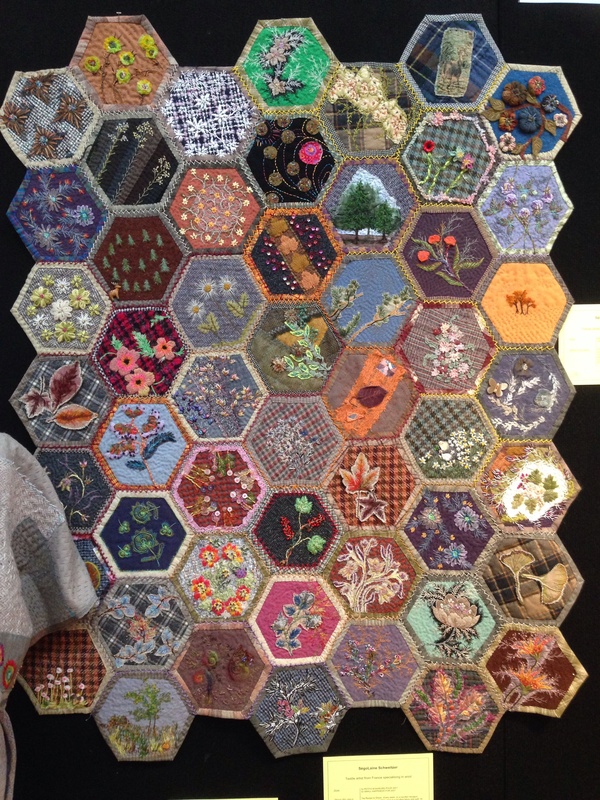 Helen designs the projects for the hexie and appliqué clubs and she had those any many more on display. It was useful to see the finished projects and gave us an idea of what to choose for the following months. Helen also had some other interesting projects that the stitchers in the group would love. Next up we had a laugh with Deb Layt. Deb has just published a book on her original technique she calls ‘Geoweb’. 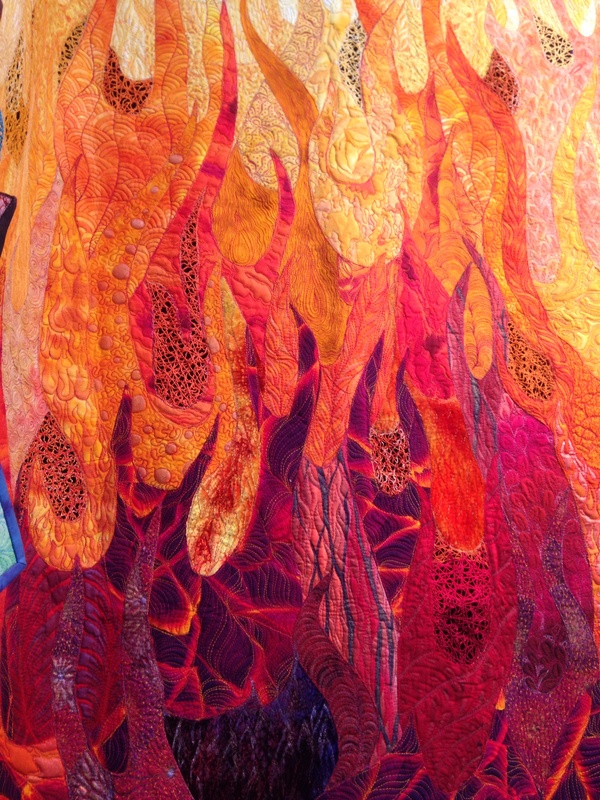 If her quilt ‘Fire and Ice’ is anything to go by this will inspire many people to read how she achieves such wonderful results. 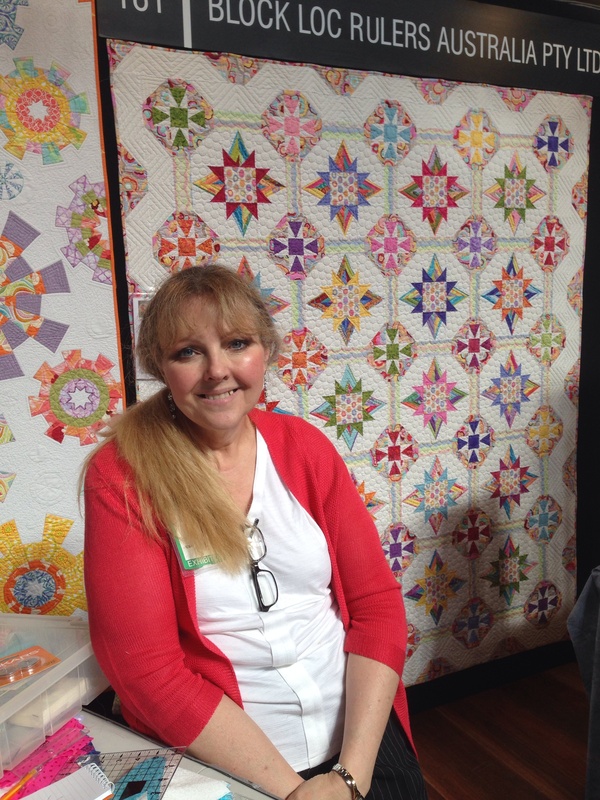 A frequent visitor to Apatchy Quilting, Lisa Walton was on duty at the show and in fact had to step in to cover Lenore Crawford’s classes when the latter was unable to attend due to illness. Quite big shoes to fill but I’m sure Lisa managed. We were discussing another class at Apatchy and she suggested her ‘Fusion’ class. 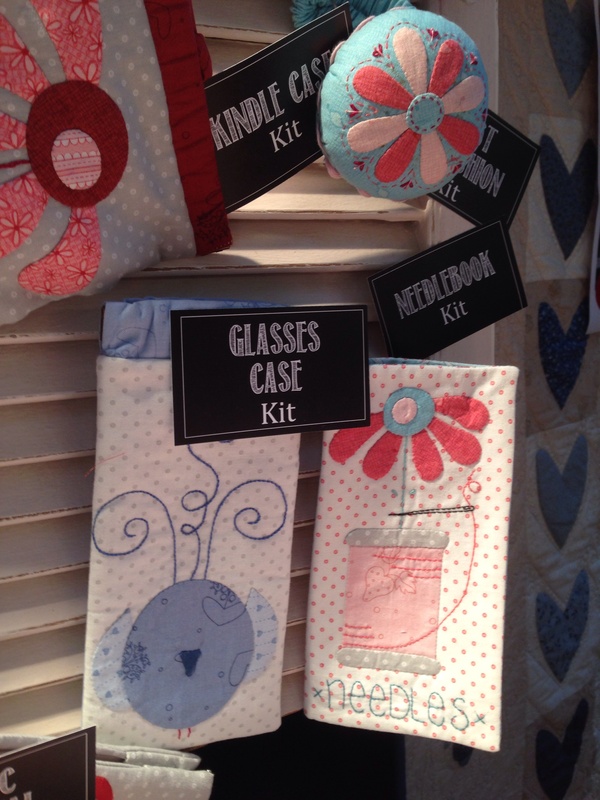 It involves improvisational piecing and proved very popular at AQC with the classes being booked out in two hours. Way to go Lisa. 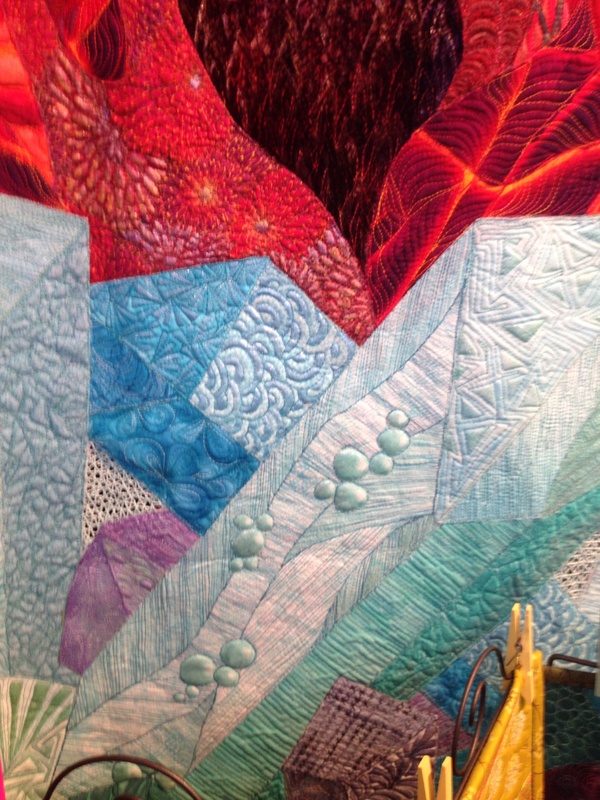 While we’re on the subject of improvisational piecing, Deborah Louie, on the Bernina stand, was obtaining interesting results from improvisational stitching providing additional texture to quilted fabric. 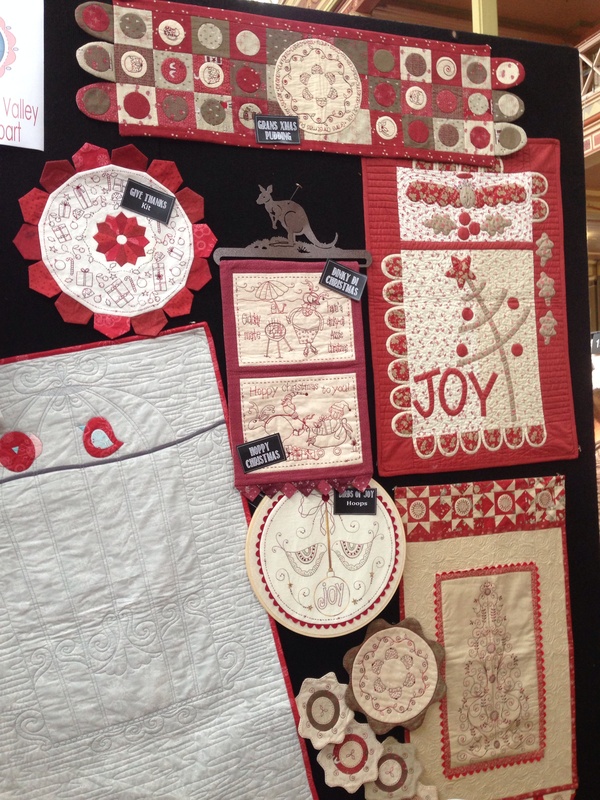 Marg Low had whimsical stitcheries on her stand, many of which she partners with buttons from Theodora Cleave. She has promised to send me a catalogue so that will be another blow to the budget. Another impressive display was from the guest artist Segolaine Schweitzer. She works with wool and although we haven’t seen anything like this at Apatchy, it was very interesting and inspired us to think what we could do with our projects. Particularly interesting was her 52-block piece – that’s one block every week for a year – does that give you any ideas? Ironically we came to Melbourne and caught up on the Brissie gossip with Kez from CheraBella Buttons. You can always rely on her to know absolutely everything that’s been going on in town and she promised to drop in to Apatchy to do a trunk show very soon so we will lock her into that when we get back! I didn’t get a photo with Kez because I was too busy talking to her! Just up from Kez’s stand were the Bloc Loc people. 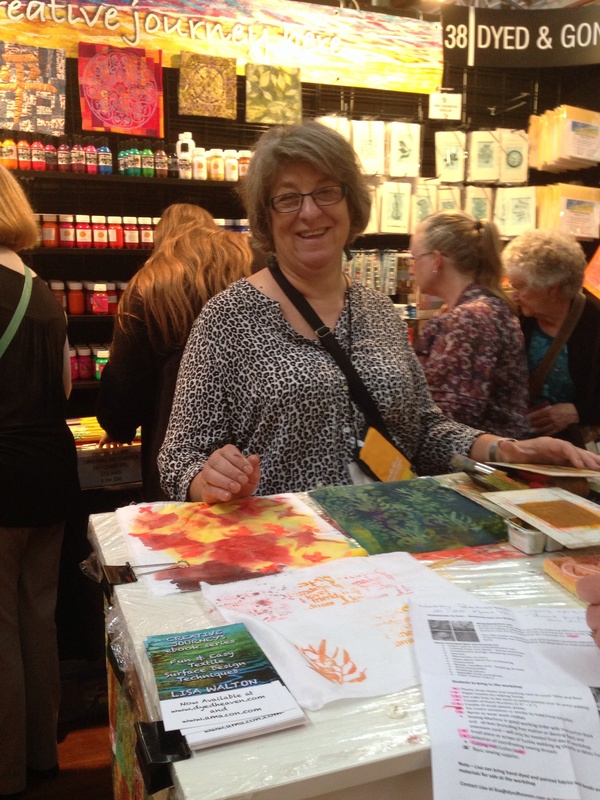 I watched a demo on Saturday from Janna Andrews showing the rulers that she and her husband developed. These rulers have been designed to take the stress out of half square triangles and actually just about every other tricky piecing shape including the drunkard’s path block. These rulers ‘lock’ onto the diagonal seam and take your accuracy to a whole new level. I was quite impressed and thought of several girls who could benefit from one of these rulers (me for one). I think they will have to be on next month’s purchases list. Thanks Janna. And here’s Helen effortlessly making it happen. The highlight of the show was meeting Molli Sparkles. 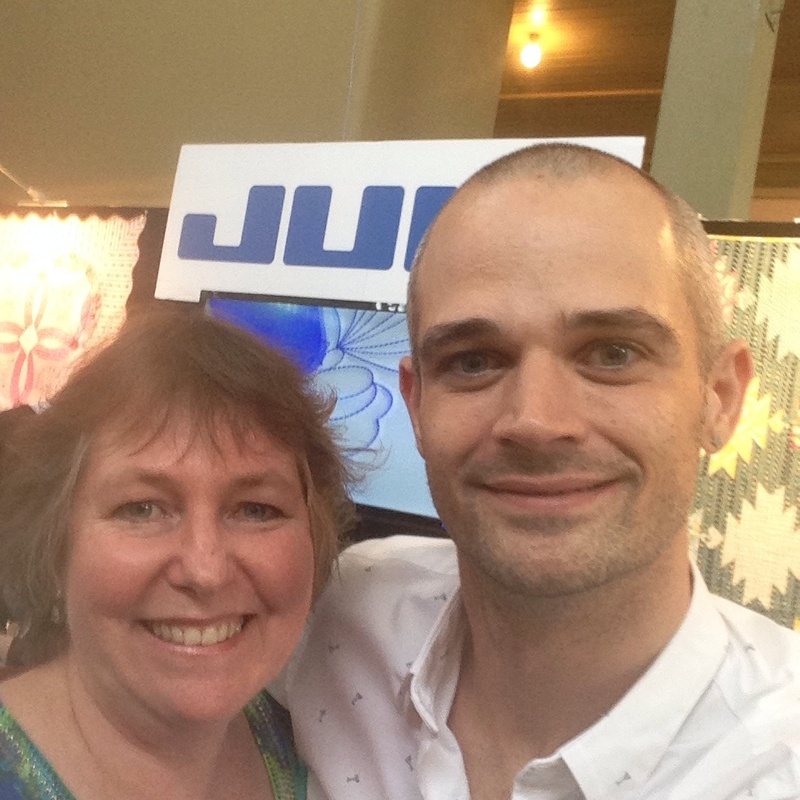 Molli blogs about his quilting adventures and I have followed his blog for some time. For much of that time he has been the darling of the modern quilt movement. And rightly so. His photographic training ensures that his composition is spot on and an artistic eye ensures his quilts are striking. I did wonder how he would manage the crowd at AQC – more the sensible-shoe brigade than his usual followers and Melbourne such a conservative city. Knock me down with a feather boa though I should not have doubted – His Shineiness was in fine form. 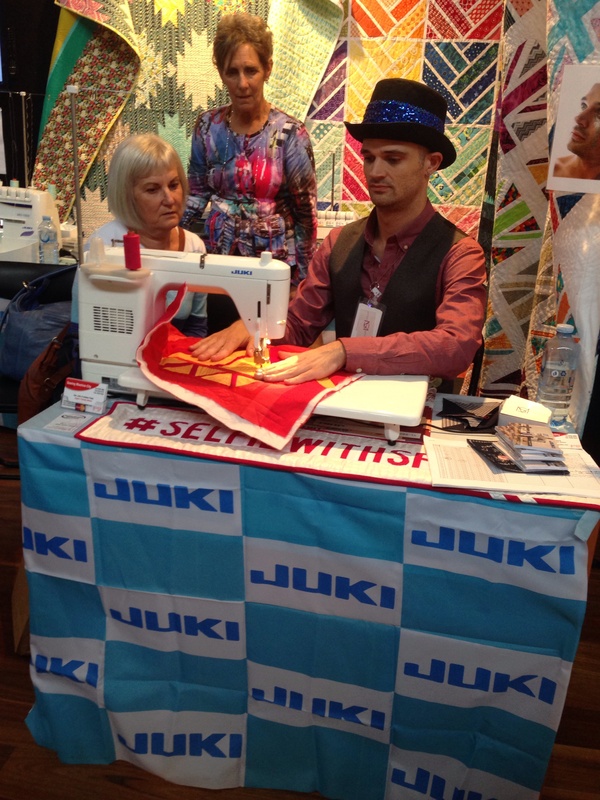 Even as his alter-ego Joshua Helms, the ambassador for Juki sewing machines, he was charming and I’m sure they sold more machines because he was there. Of course many people may not have known Molli Sparkles the blogger (and maybe you don’t. Have a look here then) but there were enough of the glitterati, as he calls his followers, to ensure that he was kept busy. We had a chat about the difficulties of running a successful blog. I would have liked to discuss this in greater detail but his public beckoned. He had a quilted sign on his table saying “Selfie with Sparkle” designed to encourage the fan photo and really how could you refuse? I’ll have to leave the stories about what’s trending until tomorrow as it’s midnight now and I’m back home and plum tuckered out. 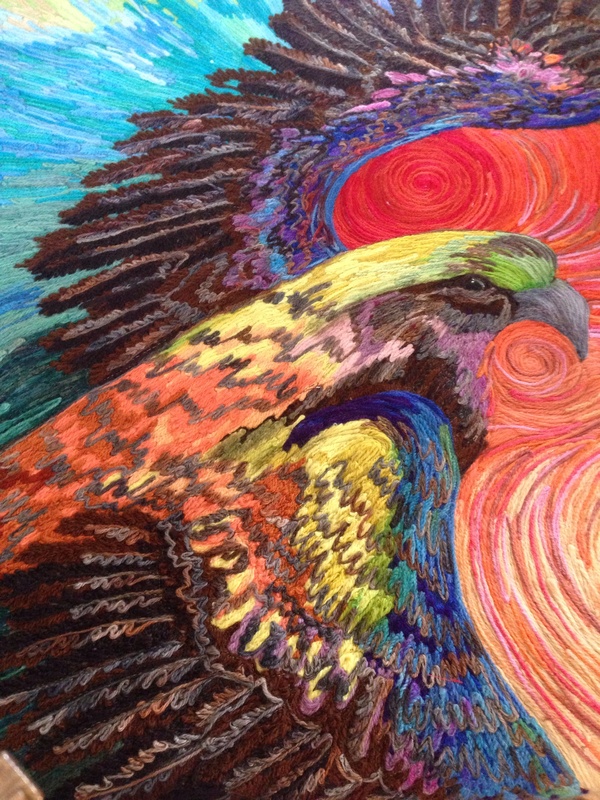 This entry was posted in Quilt shows, Special Guests, Uncategorized and tagged AQC by Apatchy Kaye. Bookmark the permalink. What a great time you and Lesa are having. I bet you will bring back some super ideas, can’t wait to see them. 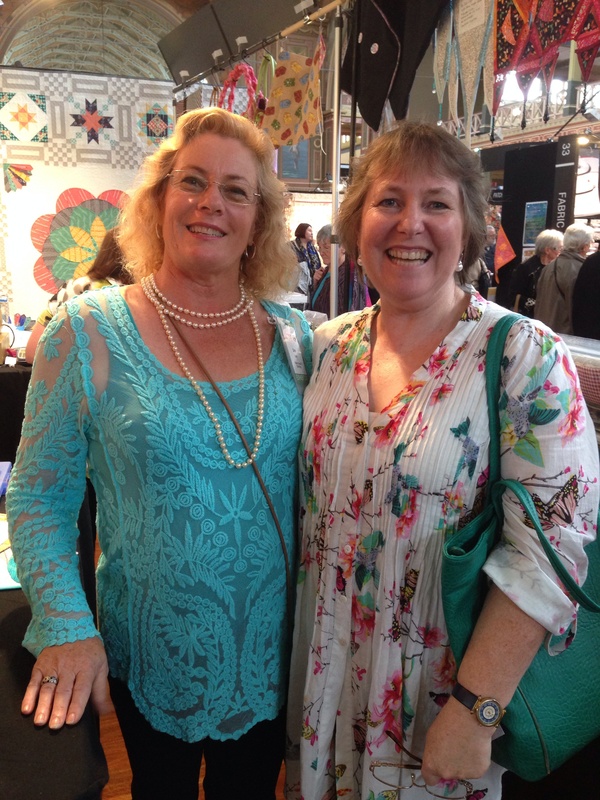 Your blog has inspired me so much, I said to John, next year I am going to visit Melbourne to attend this spectacular, it will be a good excuse for me to catch up with friends as well. The photos of the quilts you sent were amazing. Safe travels back and see you on Wednesday. Dee. 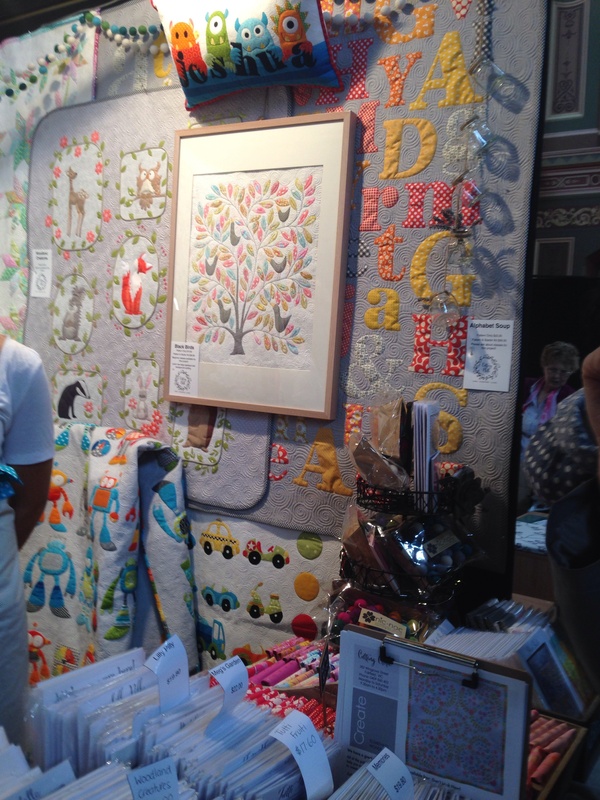 I love kellie’s woodland quilt & the alphabet quilt & the birds in the tree…..if you stock any of these, I am buying! !